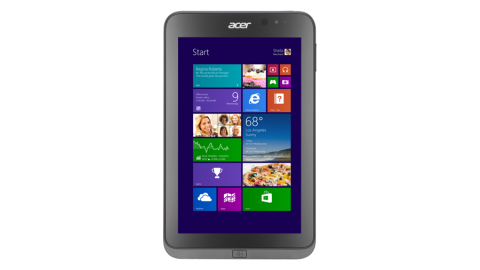 Launched at the right price, Acer's super portable and versatile Windows 8.1 tablet looks great and can cut through basic computing tasks with ease. That said, there won't be enough internal horsepower here to satisfy power users. The Acer Iconia W4 is the follow up to the Iconia W3, the first eight-inch Windows 8.1 tablet that raced out of the traps almost a year ago. While the W3 proved that it was possible to squeeze Windows into a miniature microslab's frame, its deficiencies made it difficult to care. Sporting a grainy, low-quality display powered by an underwhelming Intel Clover Trail CPU, it didn't so much scream 'first-gen' as shout it from the rooftops. Its successor makes improvements in several key areas in a bid to take on newer, flashier entrants in the eight-inch category - including the Toshiba Encore and the Dell Venue 8 Pro - as well as Lenovo's business-focused ThinkPad 8. Once again, the device comes with a free copy of Microsoft Office Home & Student 2013 thrown into the mix, meaning you can get access to Word, PowerPoint and Excel (but not Outlook) using a supplied code. The Acer Iconia W4 is powered by a fourth-generation Intel Atom Bay Trail processor clocked at 1.8GHz that's backed up by 2GB of RAM, which is a small amount compared to what you would find in most laptops, or even high-end smartphones. That's set to change. Intel's upcoming 64-bit Atom processors are due to arrive in smaller tablets soon, something that was recently confirmed by Microsoft. As such, future tablets will come with 4GB of RAM, providing a much-needed speed boost. If Acer makes an Iconia W5, it could be one of the first. The Acer Iconia W4 is available now with 32GB or 64GB of internal storage, along with an RRP of $299 (around AUS$334) and $349.99 (AUS$390) respectively. In the UK, the 32GB model can be picked up for around £250 from Amazon (£299 for the 64GB model). Staples is also offering the 32GB version for £250 and is running a promotion until April that can net you up to £250 for trading in your old netbook, notebook or tablet. If you're unsure which capacity model to go for, be warned that the 32GB version's SSD comes with just 15GB of usable free space out of the box. As such, you might want to consider picking up a microSD card to expand your storage by up to 32GB. Be warned though: Windows 8.1 can be finicky about what apps you can install and run on a microSD card, so if you know that you'll be installing large apps - such as Steam games - opting for the larger capacity model wouldn't be such a bad idea. So has the Taiwain-based company morphed its Iconia W3 into a dream Windows 8.1 tablet? Or has it remained eight inches of pure nightmare? Continue reading our review of the Acer Iconia W4 to find out.